There are no good options on North Korea. Zero. 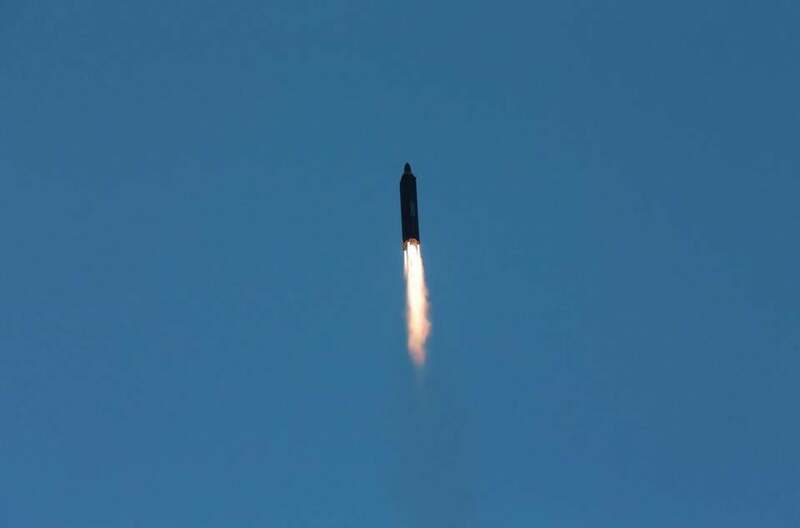 A photo released by North Korean state media shows a test launch of the North Korean rocket. North Korea successfully tested an intermediate-range missile over the weekend, the latest advance in its quest to produce a nuclear-tipped missile capable of reaching the United States. The Trump administration quickly condemned this latest test, having responded to earlier North Korean provocations with a mix of tough talk and serious action, including setting up a new missile defense system in South Korea and pressuring China to use its substantial leverage to curb North Korea’s military ambitions. Yet the United States has been trying to curb North Korea’s nuclear ambitions for decades, without success. Negotiations have repeatedly failed; sanctions, too. And if those setbacks seem like reasons to try something more forceful, military action carries a perverse risk: You may trigger the very nuclear war that you’re trying so desperately to prevent. How advanced is North Korea’s nuclear missile program? North Korea has nuclear weapons, along with various medium-range missiles. Still unclear, however, is whether they have the capacity to combine these, attaching a nuclear warhead to rockets that could reach Seoul or Tokyo. But if they haven’t managed this feat yet, there’s little question that they will soon. After that, the next goal for North Korea is likely to be a workable long-range missile, something which could deliver a nuclear strike against US cities. An earlier failed test suggests that this capability remains elusive, but even failures provide useful information for future development. And it may only be a matter of a few years before Kim Jung Un’s regime can credibly target Los Angeles or even Washington, D.C. Above all, North Korea’s leadership wants to remain in power. Kim Jong-un, the North’s leader, learned a crucial lesson watching America overthrow regimes in Iraq, Afghanistan, and Libya: Unless they can fight back, rogue governments exist at the mercy of the United States. But nuclear weapons are a great equalizer. In that sense, North Korea’s nuclear program isn’t a bargaining chip to be traded for economic benefits or sanctions relief. It’s a political lifeline for Kim, who otherwise would be just another vulnerable leader of a relatively small country. With the right mix of forceful diplomacy and credible threats, it’s possible the United States would be able to stare North Korea into submission. Or at least get the regime to stop its near-daily provocations and return to the equilibrium of subdued hostility. That’s often how North Korean defiance gets resolved. The North Koreans cross an established line — say, by bombing a South Korean island, as they did in 2010. In response, the United States and its allies mount a carefully calibrated counter-operation. After this, action gives way to stern words, which echo briefly before quieting. ■ Intervention. North Korea’s stated plan for responding to a US attack is to go nuclear, quickly. Harsh and certain retaliation of this sort can be a powerful deterrent, because it threatens to turn even the most constrained military strike into a potential conflagration. And while you might hope to preemptively knock out all of North Korea’s most dangerous weapons, a single hidden nuke could mean a mushroom cloud in Tokyo or Seoul. Not to mention that even without weapons of mass destruction, the North Koreans have enough conventional weapons to kill millions across South Korea. Now it’s possible that all this nuclear posturing is just a bluff. Perhaps, in the event of a frontal US assault, the North Korean leadership would capitulate without firing its deadliest weapons. But that’s quite a gamble, especially when dealing with a regime that has regularly defied international demands and starved its own people to maintain power. ■ Negotiation. Presidents Bill Clinton and George W. Bush both tried to negotiate their way to denuclearization, without success. Still, it’s possible that with the right mix of carrots and sticks, the Trump administration could find a workable agreement. Inducements might include lifting sanctions, acknowledging the legitimacy of Kim’s government, or cutting back on US forces in South Korea. However, given that North Korea sees its nuclear weapons as an essential safeguard against US intervention, it might be too much to demand complete denuclearization. Instead, the goal could be a nuclear freeze or some check on long-range missiles. ■ The unorthodox. There are two wild-card efforts that could also alter the balance of power. One is cyberwarfare, which the United States has already been using to sabotage elements of North Korea’s missile program. The second is missile defense, which could help insulate neighboring countries against the North Korean threat. In recent months, the United States has installed a new missile defense system in South Korea — over the objection of China. But the real-world effectiveness of such systems is still uncertain. And intercept rates of less than 100 percent will always leave cities vulnerable to nuclear attack. ■ Containment. This was the unspoken stance of the Obama administration, which tightened sanctions but never found a tractable path for dealing with North Korea. And there is at least one reason to think containment could work: Kim has never demonstrated a desire to expand his territory or extend his rule. However, if North Korea maintains its nuclear program, there is always a risk it could share its nuclear knowledge and technology with other nations — or with terrorists. What about China (and South Korea)? China has a lot of leverage over North Korea, including the ability to cripple the already weakened Korean economy via a blockade on energy and trade. But China doesn’t want to trigger the collapse of Kim’s government — not without knowing what would follow. Otherwise, they’d risk turning North Korea into a neighboring Syria, only worse: all the refugees, all the infighting, plus loose nuclear material. And remember, China isn’t the only uncertain player in all of this. South Korea recently elected a more liberal President who seems interested in engaging more directly with North Korea, opening talks and increasing cross-border confidence-building. That could complicate US efforts, potentially requiring the United States to withdraw its latest missile defense system. China has repeatedly warned both sides about the threat of stumbling into war, but so far neither the United States nor North Korea has shown a willingness to stand down. As ever in the decades-long tale of North Korean defiance, the most likely outcome is more of the same: periodic eruptions of boiling tension, followed by long periods on simmer. But each episode brings a real risk of confrontation and the chance of nuclear fallout. The biggest unknown this time around is President Trump, who is famous for his aggressive negotiating posture — and who remains relatively inexperienced in foreign affairs. So far, he seems to be taking a hard line, insisting that the North Korea nuclear problem be solved, with or without China’s help. The months ahead may reveal whether his stiffened approach opens the door to a breakthrough, or simply increases the risk of major conflict.